A Coles gift card scam offering a $500 gift card and a malware infection has been caught by MailShark spam filters. 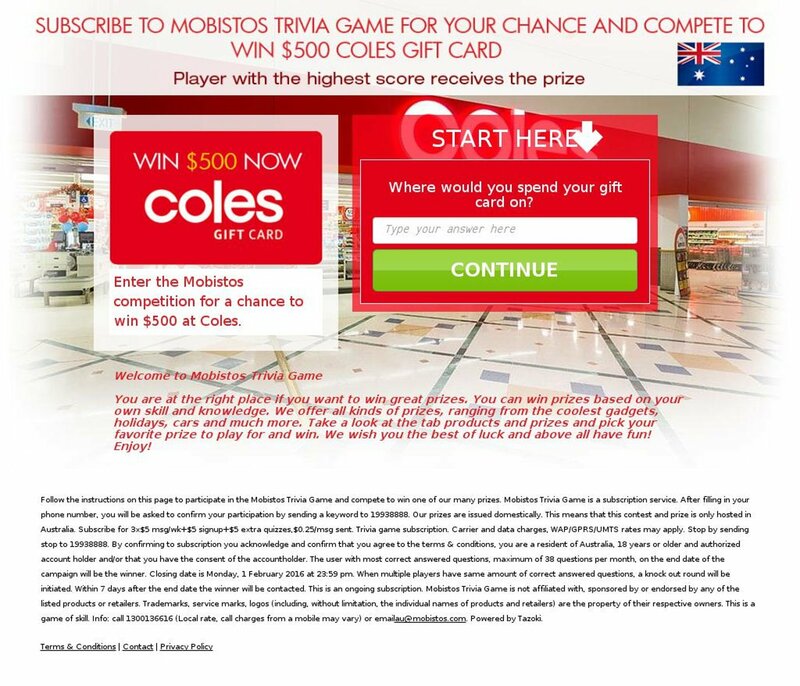 Coles is a common company targeted by scammers using the ‘gift card scam tactic’ – it is a major Australian supermarket employing over 100,000 Australians and a major employer of indigenous Australians. Delete this email from your inbox if received and avoid clicking any of the malicious links in its contents. 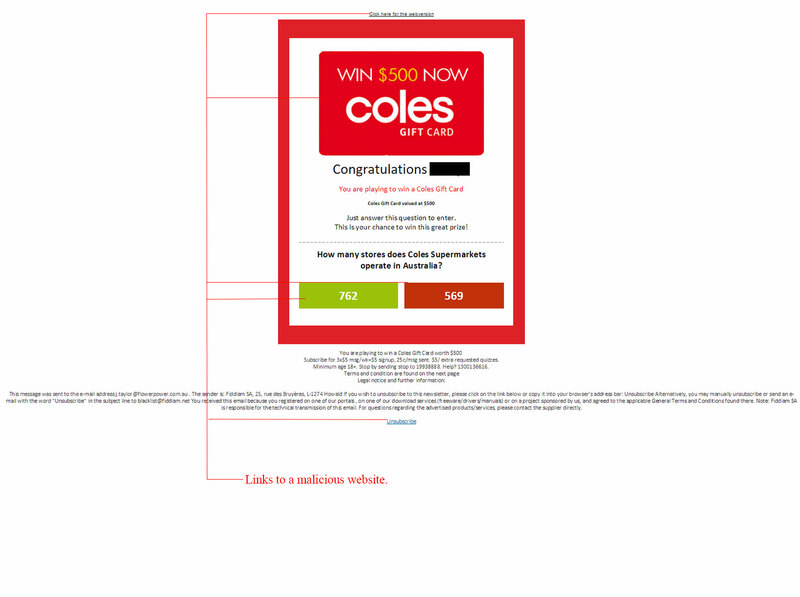 Figure A is a copy of the $500 Coles gift card malware scam email that has reached inboxes. It is branded to suit the supermarket chain and is mostly red and white. There is a lot of text in the email and several malicious links which will lead you to a dangerous website, which will attempt to infect your computer with malware. It attempts to instil confidence in the receiver by using a personalised greeting (in black for privacy reasons). The subject line reads “Play to win a Coles Gift Card”, which intrigues the receiver’s attention. The sender is shown as “Supermarket service”, however the sender’s email address is in no way associated with the official Coles website and is obviously spam. They have used a quiz tactic to increase your chances of clicking through, by asking a question with two boxed answers to choose from – both of these, if clicked, will lead you to the same dangerous website, along with all other links within the email. Figure B is a copy of the malicious website you will land on if any links within the email are clicked. It is an extremely busy website and claims to be hosted by something called “Mobistos Trivia Game”. All of the content on this page is fake and a charade to convince you to either click or answer the question on the right, which claims to be the start of the quiz type game. Also note at the bottom in small writing, there is a paid commitment which also makes this a money scam. Be warned that you could end up with a malware infection and an unexpected bill. MailShark strongly suggests removing this email from your inbox to avoid clicking within the email or reaching the malicious website. Gift card scams are all too common at the moment, so be extra cautious when you receive something of this nature in your inbox.